It is the responsibility of all parents to check their child's hair weekly for head lice and to provide adequate treatment if head lice is found. If your child has head lice you need to inform me right away. This way I can inform all other parents that head lice has been found in the Daycare. The sooner all parents are aware of the lice the sooner they can check their children and we can stop the outbreak before it gets too big. An infected child can return to daycare 48 hours after the 2nd treatment has been done and that you have confirmed that all lice are dead and the nits (eggs) have been removed. The treatments can be done within 7 to 10 days from each other, depending on the treatment used. It takes 10 days for an egg to hatch, if you miss just one then you will have a whole new out break. This is why you need to keep your child home this long. During a head lice outbreak my Daycare will remain open for all no-infected children. It is up to you whether or not to bring your non-infected child or not. However, if I or an member of my family have lice, I will have to close. Payment will still be due in full. All steps will be taken to remove any head lice from the Daycare/my home as quickly and safely as possible. If your child or you brings lice into the daycare and the daycare has to hire a professional to have them removed, you are responsible for all cost of the professional removal of the lice. If your child brings in lice more than once, the daycare has the right to terminate care. Head lice are very small, less than 1/8 inch long, tan colored insects that live on the human head. They live and lay their eggs, called nits, close to the scalp. The nits are tiny and are gray, white or brown. The nits become firmly cemented to the hair shaft. Anyone can get head lice. They are not a sign of being dirty and do not reflect poorly upon parents. Head lice are a common problem any place where there are groups of children, such as child care settings and schools. Itching and scratching of the scalp and neck are usually the first sign that head lice are present. The areas most often affected are behind the ears and the back of the neck. If lice or nits are found on the head of one person in a household, the heads of all household members should be checked. Look for crawling lice in the hair near the scalp and nits glued to the hair shafts. They are usually found within 1/2 inch of the scalp. When do the symptoms appear? It may take two to three weeks before the intense itching is noticed. 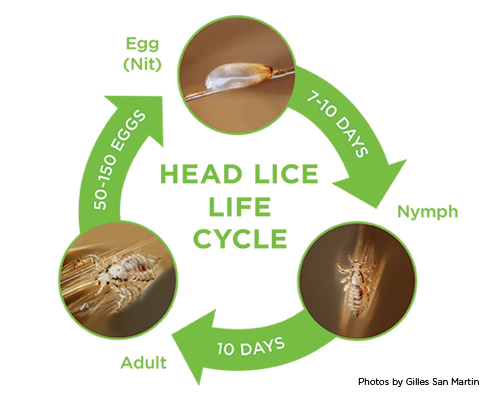 Head lice are passed from person to person by direct contact, on shared personal items (combs, brushes, hats, scarves, sports headgear, jackets and other clothing) or by contact with infested bedding, furniture, or carpeting. Head lice do not fly or jump. They crawl and can fall off the head. Lice do not usually live longer than 48 hours off the head. They only lay their eggs while on the head. It is unlikely that the nits will hatch into insects after they have fallen off the head. Lice do not spread to pets and you cannot get them from pets. Lice control products come in the form of shampoos, creme rinses and lotions. Some products are available over the counter from a drug store and some are only available by prescription. If you are on medical assistance contact your physician for a prescription. Contact a physician before using any lice control product on an infant or a woman who is pregnant or breast feeding. It is recommended that the hair first be washed with a shampoo that does not contain a conditioner or creme rinse. Baby shampoo and Prell are two good examples. The head should be rinsed as usual. Some products are to be used on a dry head, others on a head that is damp. Only those people with actual lice or nits should be treated because use of these products will not prevent someone from getting head lice. Follow the directions carefully. The directions are not the same for every product. The lice don't always die immediately. It might take up to 24 hours. If live lice are seen two days after treatment, retreat with a different brand. It is recommended that all nits be removed as part of the treatment. A special fine toothed comb is usually included with the product or can be purchased separately. However, many people feel that the most effective way to remove nits is with fingernails. There are also nit loosening products that you can use after the lice treatment shampoo. Be sure to clean your fingernails thoroughly with hot soapy water and scrape under them if you used them to remove nits. After the hair is dry, recheck the head for any nits left over and remove them. After treatment check the head ever day for several days. How can the spread of head lice be controlled? Combs, brushes, and similar items should be soaked for at least 10 minutes in hot (30 degrees) soapy water or a lice control product solution, then scrubbed with an old toothbrush that you can throw out. Recently worn clothing, including hats, scarves, jackets, pajamas, etc., should be washed in hot water and dried in a hot dryer for an least 20 minutes before being worn again. Items which cannot be washed should be dry-cleaned, or sealed in plastic bags for two weeks. Items such as sports headgear, headphones, stuffed animals and pillows should also be bagged and stored for 2 weeks. Clean floors and thoroughly vacuum carpets, furniture, mattresses and the seats of cars. The use of lice killing sprays is not recommended. How can the spread of head lice be prevented? Check children's heads frequently throughout the year. Especially if they are in childcare or school. Avoid sharing items for hair care, clothing, hats, sports headgear, towels, and bedding. Avoid sharing lockers. If jackets are hung on hooks close together tell your kids to stick their hats in the jacket sleeve, not on a shelf by the other kids' hats.